The two newest colors are Valspar's June Morn (bottom of the middle row) and Olympic's Serene Stream (the loner on the left... not the far left... the "middle" left ?). And can I tell you that I love both colors?! Maybe it's because it reminds me of my inspiration photo? So.. in true Gina fashion.. We get a mock-up of what I'm wanting that wall to look like..
First, I have some green fabric that i want to recover the chairs in.. It doesn't look puke green, like in my mock-up. But I really want to tie a lot of green into the room, so I'll bring in the green chairs, green accents on throw pillows, and some knick-knacks on the shelf. 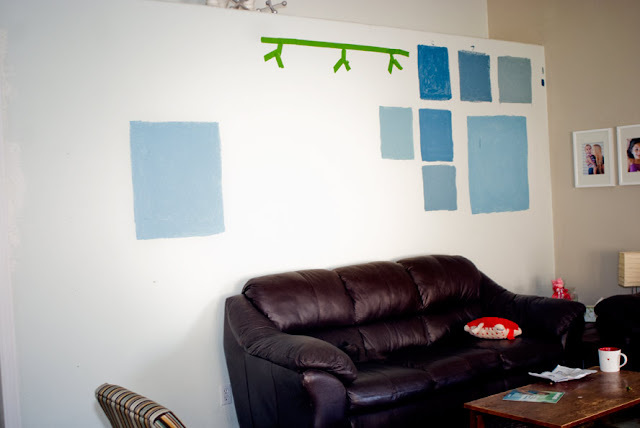 I think adding the green (and taking the blue from the chairs) will make the blue wall "ok" - and make it so that not EVERYTHING in my main living area is blue. That lighting fixture is one that I've been leaning towards. It's not "perfect", but it's pretty darned close to what I want (maybe I can find some new shades?). It's from Sea Gull Lighting, and it's about $250. I was hoping to find something for under $200, but I may have to up my budget a tad (I've got a few more choices pinned here). And these darned pillows! From WAL MART, of all places... I JUST LOVE THEM!!! 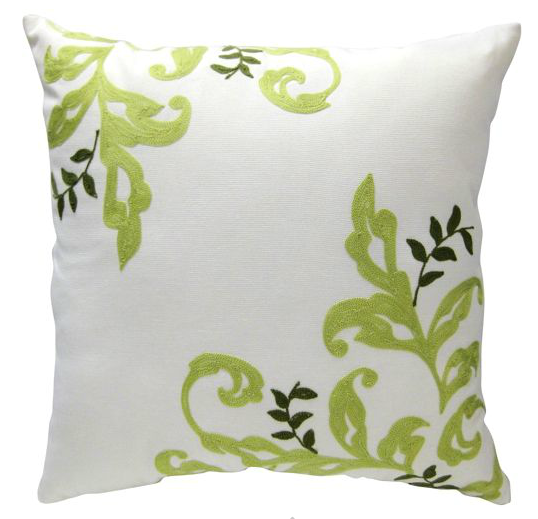 I think it was these pillows that made me want to bring green into the room. When I first saw them, I wanted to buy like 10 and put them everywhere. L.O.V.E. What're your thoughts? Should I just get over the light blue? Maybe pick a different fixture? 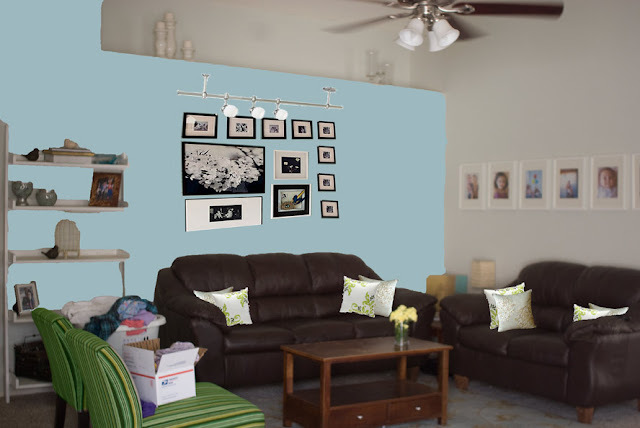 Light blues are not very warm and can appear quite weak vs. the sofas. I'd consider a warm green gray, or Mediterannean wall color (oker), because your sofa is quite large, strong statements, dark. Choose your walls in harmony with the sofas! my 5 cts, and I'm not the best at this. I am actually coming to your site re. the FOLLOWER linky blog hop. *** I am now following you **** Will you follow me back?? *** Thank you so much when you do. I love your inspiration color! Where did it come from? See if you can color match it. I'm thinking your mock up is a brighter blue. I really like the laundry accessory on the chair. At least your's is in a basket. Mine is just thrown on the bed. You do know how to keep us waiting in anticipation! What color did you end up using?!!!! Inquiring minds want to know! I know, I know. I'm sorry :-) The truth is that I now only have MORE squares added to my game board wall (that's now what it's called, btw).. and haven't PICKED a color yet. So don't worry! I'm not holding out on you... Just... being lazy/indecisive!